A single bispecific antibody can bind to multiple antigens, resulting in more specific targeting, novel mechanisms of action and higher clinical efficacies. 31-Aug-2017: A group of researchers has developed an approach to efficiently produce antibodies that can bind to two different target molecules simultaneously, a long-desired innovation in the field of cancer immunotherapy. 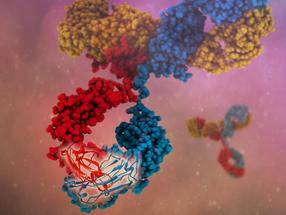 One bispecific antibody-like drug - the leukemia drug blinatumomab - is currently on the market. But development of more therapies based on bispecific antibodies has been hampered by technical challenges. For example, certain bispecific antibodies deviate from the standard Y shape and tend to be less stable than conventional antibodies, falling apart easily. Further, certain bispecific antibody formats have tended to be difficult to produce at industrial scales because they can require specialized engineering processes. The four mutations were in the "heavy chain" protein components of the antibodies. Typically, two identical heavy chains pair up in each antibody. The challenge in creating bispecific antibodies was to induce non-identical heavy chains to pair--creating "arms" capable of binding different antigens - while discouraging pairing of identical ones.